· Replacement remote control for ZOOMTAK Android TV Box. 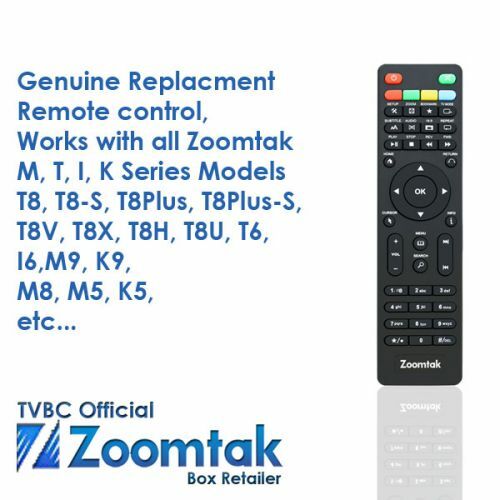 · This Remote Works with: T8, T8-S, T8 plus, T8Plus-s, T8V, T8X, T8H, T8U, T6, I6, M9, K9, M8, M5, K5 etc..
· If you do not find ZOOMTAK Model here please contact us before you order and we check the compatibility. · This product has 14 day Manufacturing defects limited warranty only. · This product is NOT warranted against dropping it or water / tea / coffee etc damage. · No batteries are included. · Price includes delivery with Royal Mail signed for postal service.